I have spent a bulk of time doing a research on what is the best laptop stand for desk, what kind of adjustable laptop stands are commercially available and what options are the best ones for working in the upright position. You may read about all my findings below, in a review of TOP 9 Best Laptop Stands. When I say that laptops must be necessarily used on stands, it is not my whim or a tribute to fashion. This is about health concerns and, believe me, we should take it seriously. First of all, when working in an uncomfortable posture, you are most likely to have pains in the necks, shoulders and even in the back. As doctor Kevin Carneiro from the University of North Carolina found out, using a laptop almost inevitably leads to poor posture, causing such problems as sore muscles or repetitive stress injuries. Also, bear in mind that all of us have physiological characteristics unique to each particular person, while most items of furniture is a result of the standardized mass production. So, what you can do is to purchase a laptop stand and adjust it in such a way that you have an optimal view and can avoid the neck strain. But there is much more. Those who prefer to work in a sitting posture with a notebook on the laps or in a lying position with a laptop on the belly are likely to face more severe health risks. According to scientists from PennState University, the EMF values in laptops, especially when the device is placed close to the body, are considered risky for tumor development. For this reason, you should better put a laptop on a table or use a thick pillow. Keeping notebooks on laps poses hazards for men in terms of their reproductive health. “A study to evaluate the direct impact of laptop use on human sperm was published in January 2012 in Fertility & Sterility, showing a significant decrease in sperm motility and an increase in sperm DNA fragmentation. And this was after just four hours of exposure,” the researchers indicate. That's why, I prefer using my laptop in a standing position. I had been trying various stands until I came across an option which is the most appropriate for me. I spend the whole day with my laptop, which has naturally resulted in the development of osteochondrosis of the cervical spine and pains. The issue of the workplace ergonomics came up. I started looking for a laptop stand. First, I purchased an adjustable cooling Fan Laptop Table so that I could work in a reclining posture. This helped me somehow, however, this option is more appropriate for entertainments, while for a long work such posture was not the best choice. 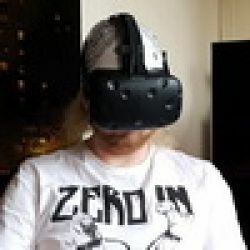 Therefore, I left the adjustable laptop stand to playing games, where it is impossible to connect a gamepad, while for work I start to look for a high telescopic laptop stand in order to be able to comfortably work on foot. In an anatomical sense, a standing posture has both strong and weak points. A significant downside is a load on veins of the lower limbs but if you do breaks every half an hour for 5 minutes to walk up and down, this negative impact will be smoothed out. The load on the back is significantly reduced. The load on large muscles increases, which means more calories are consumed. Prevention of hemorrhoids. As you may know, a seated activity in such professions as programmers, truck drivers, and accountants is a hazard area. 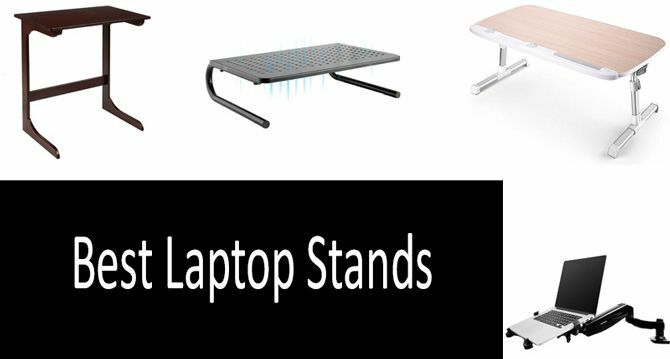 For standing activity, there are several options: a telescopic table, a hand designed to be attached to a regular table and a stand with a mouse tray, which I have eventually purchased (to learn about other models, see below in my review of the Top 9 Best Laptop Stands). The only downside of my laptop stand is that there is not enough space on the tray for a regular mouse, so I had to buy a special one with a trackball. I have picked the best laptop stands of different types. They can be loosely grouped into stands for sedentary work, for the upright position, and for using a laptop on the bed. And yet, such classification is conditional because most of the products are adjustable and multi-purpose. Other important criteria are sturdiness and the weight of the product because the best option should support the weight of any laptop and, at the same time, be easy to move or place on the desk and bed. Another feature, which is particularly important for rooms with stylish decor, is the product appearance. Yes, the design of a laptop stand also matters since you will buy one more item of furniture anyway. This laptop desk stand is made of steel with perforated holes, which allows for an air flow so needed to keep the laptop cool. With this stand, your monitor will be raised by four inches, which is helpful in reducing pains in the neck and back. That is why this is a good ergonomic option. What is crucial is to keep the monitor on a stable height, otherwise, your eyesight will be negatively affected. The Monitor Stand Riser has a solid steel construction, so the device stays still and in one place. When placing it on the desk, you get an advantage of an extra storage space, where you can keep papers and other stuff needed to be at hand. Its rating is 4.6 out of 5 stars. Consumers claim that the stand can be effectively be used to raise a laptop up and point out that the device is very sturdy. Megainvo is less sturdy but has a benefit of being an adjustable laptop stand, with the height ranging between 12 cm and 20 cm. It is a good choice if you need to have your laptop screen at eye level, allowing to assume a convenient bodily posture and avoid pains in the neck and back. Since the structure ensures a ventilation, the laptop will not be overheated. Also, the laptop desk stand is easy to use, with its big-small stops designed to fix the laptop to the stand. Being an aluminium device, it is lightweight but, at the same time, stable and durable. The stand is capable of sustaining the weight of as much as 15 kg. Its rating is 4.8 out of 5 stars, with 88% of the customers giving it five stars. “This item is designed uniquely to prevent neck damage from a long-time laptop operation. Probably can match everyone,” a customer noted. This item can be used for different purposes: both for sedentary and standing work. The position can be adjusted to the required level, depending on your need. Therefore, your laptop will be held at virtually any position or angle. Moreover, this adjustable laptop stand can be rotated 360 degrees and locked in place at various angles. Apart from being a multi-function device, it is equipped with fans designed to quietly cool the computer. What you need is to connect a USB cord, which comes with the product, to the laptop and the latter will never be overheated! Its rating is 4.2 out of 5 stars, with over 1,800 customer reviews. “We have used it with success for several reasons, as a low-cost way to raise to ergonomic level from a 2 drawer file cabinet level; for use at a standing workstation and for bed-level work, both hotel and hospital bed. All good,” a customer commented. For seated activity, this item perhaps will be the best bet, since you will have a table and a convenient laptop holder simultaneously. This is a stylish laptop stand and wide enough for you to put there not just a computer but all required accessories as well. You may use it as a breakfast tray, reading rack on the bed, standing desk or a working desk in a car. The main downside is the absence of a fan preventing the device from overheating. Its legs have smart latch locks on each side for adjusting a needed height from 9.5 to 13 inches. So you may use it both in lying and standing position. Its rating is 4.9 out of 5 stars, with 95% customers giving it five stars. “I sit on my couch with my legs extended out and it works Great! I'd assume it would work perfectly fine for a recliner as well,” a customer noted. Perhaps, this item is the best laptop stand for using on the bed because of its light weight amounting to only 2.9 pounds. You may use the table for working in lying position, as well as for having a breakfast or watching a movie while resting in bed. It perfectly fits a 16” laptop, plus a space for the mouse and an inner compartment for keeping notes. The ample space between the legs allows stretching the feet under the table in the most convenient way. Since this laptop stand is designed for use on the bed, you should know its another advantage of having the non-slip bottom so that the table remains steady while you are working behind it. Do you have to travel a lot? No problem, this stand is foldable and easy to carry, so you will be able to use it anywhere, including camping and hiking. Its rating is 4.5 out of 5 stars. “Great product. Very Sturdy joints and legs. Very happy with this product,” a customer said. This product looks like a character from “Transformers” movie due to its expandable work surface and adjustable height. The width of the table can be changed within the range of 13 and 22 inches, while the height can be adjusted from 12 to 29 inches. Also, the product is not complicated at all and easy to set up without any tools. A cup and PDA holders is an added benefit of the laptop stand. However, there is a drawback: in order to work with your computer in a standing position, you have to place the stand on existing desk, therefore, this item should better be used for the seated activity. It should be noted that the product has the lowest rating on in our review, with customers giving it just 3.8 out of 5 stars. “Ergonomically, It is not a standing height table. I use it at maximum extension while sitting. Standing, You would be looking down and your arms would be down to type,” a customer emphasized. For those enjoying to work in a standing position, this is the best laptop stand and the highest one in this review. Because of the product’s heavy-duty steel construction, you can safely take it with you on a trip. Another advantage lies in the item’s surface being made of silicon, which means that a laptop will be held securely in place. For your convenience, there is a tilt control on the laptop surface. The downside is that although any laptop perfectly fits the desk, there is not much room for accessories like a mouse. Its rating is 4.6 out of 5 stars. As one of the customers put it, “It does extend high enough to stand and work at the laptop, but just as it is pictured, there is no additional room for a mouse or additional equipment”. He also added that the laptop stand was particularly good for making presentations. A good laptop stand for desk, which, however, can be used in the upright position as well. So you may change positions from time to time, without the need for interrupting the work at your computer. The arm is made of an aircraft-grade aluminum and rotates 360 degrees horizontally. Tilt angle ranges from -85 to -15 degrees. The stand supports the weight of up to about 11 lbs and fits monitors with the size between 10 and 24 inches. For laptops, a special tray is provided, given that the size of the device should not exceed 17.3 inches. Its rating is 4.3 out of 5 stars. “You do have to drill a hole in the top of your desk. I drilled two as the first one wasn't quite right. The cords are routed through the bifurcated support arm. I can actually raise the monitor and turn it 180 degrees to show my wife a page from the Internet,” a satisfied customer wrote in a commentary box. If you need a stylish and beautiful but, at the same time, comfortable desk for your laptop, look at this item. This wooden table made from a high-grade natural bamboo will fit in a stylish interior of the room. Another benefit is that this product is a multi-purpose one, so you may use it not only as a laptop stand but as a coffee table or reading table. It will look great in the bedroom, living-room or in the office. Apart from being eco-friendly, the item has one more advantage over plastic laptop stands in that it is durable and stable. Also, the laptop desk with the size of 21.6 x 13.8 x 24.4 inches is very compact, space-saving and can be easily moved to everywhere. The weak point of the product is that it cannot be adjusted to allow for an optimal view of the monitor. Its rating is 4.4 out of 5 stars, however, there are not enough customer reviews so far. “I've only used it for eating and working but I can tell you the table is very sturdy and stable and in my opinion, can hold up to 20-lbs securely,” a customer noted. Adjustable laptop stand both for sedentary work as well as for work in a standing position and using on the bed. In most cases I work at home at my desk, but I can not stand a long sitting in my chair, my back starts hurting. I see the laptop stand as the solution to this problem. I use a laptop Asus zenbook with aluminium case that is heated from the load of my notebook. So any solution for me with cooling laptop stand to reduce heating of my computer and that pain of my back! Thanks!